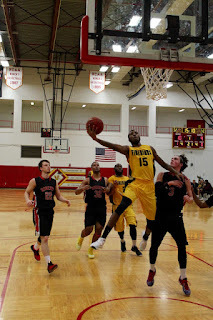 The University of the District of Columbia men's basketball team erased an 11-point second half deficit to force overtime, then made critical free-throws at the end of the first extra session to complete a 97-93 East Coast Conference victory over Roberts Wesleyan College on Sunday afternoon at UDC Sports Complex. The Firebirds (9-10, 7-4 ECC) completed a season sweep of the Redhawks today despite playing without injured senior forward Geran Pope or junior transfer guards Virgil Fleming and Martin Campbell. This marked their first overtime win in six tries since a 71-68 OT win vs. Dowling on January 7th, 2012. They were led offensively by junior transfer point guard Kasim Chandler and junior transfer forward Joseph Nickerson. Chandler registered 26 points on 10-of-13 FG shooting (2-of-4 from long range) and 4-of-5 FT shooting, while also handing out six assists and collecting a game-high four steals. Nickerson shot 10-of-18 from the field, 1-of-2 from long range, and 5-of-7 at the line for a total of 26 points as well, as he also hauled in a team-high 11 rebounds, dished out six assists, blocked three shots and collected two steals in a terrific all-around effort. Roberts Wesleyan (5-12, 2-9 ECC), which led by as many as 11 at the 13:43 mark in the 2nd half, has now lost six of its last seven games with today's defeat. Redhawks guard Marcus Gooding led all scorers with 33 points on 12-of-31 FG shooting, including 9-of-23 from three-point range. Forwards Tyrel Dixon (19 pts, 11 rebounds) and Malik Dare (11 points, 12 rebounds) both had double-double point-rebound performances and combined for six assists and four steals. 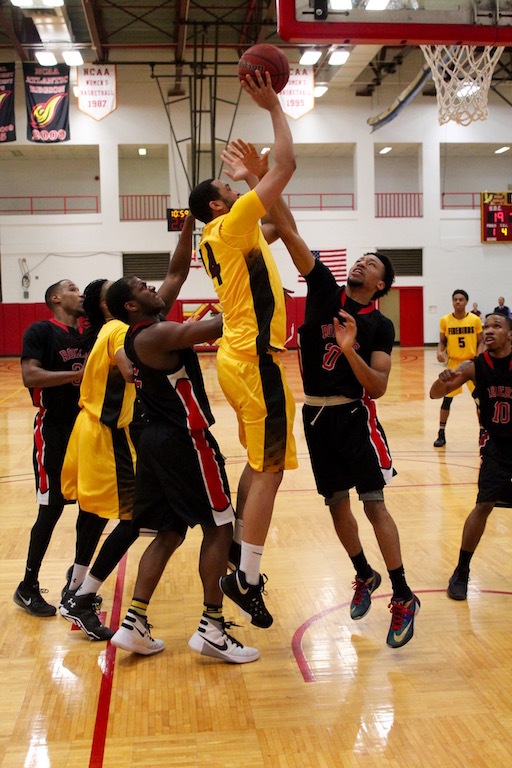 UDC out-shot RWC 51-percent to 41-percent from the field for the game, including a 60-percent to 36-percent disparity in the 2nd half. Both teams shot poorly at the free-throw line during regulation as the Redhawks missed an opportunity to put the game away with 8-of-16 foul shooting in the 2nd half. 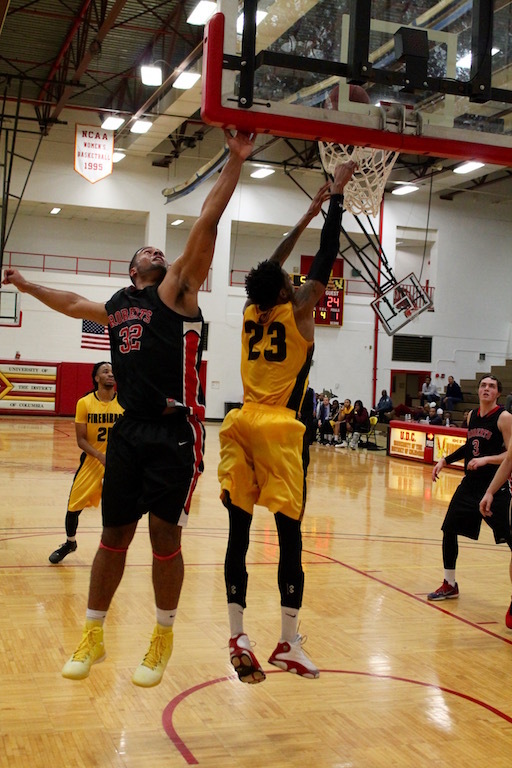 Roberts did a lot of its scoring from behind-the-arc, as the Redhawks shot 15-of-35 (43-percent) from three-point range while UDC shot 9-of-27 (33-percent). The two teams combined for 38 turnovers, with RWC turning it over 20 times to UDC's 18, and the Firebirds cashing in for 16 more points off of turnovers (28-12). Also, despite UDC missing its leading rebounder, Pope, the Firebirds were only out-rebounded, 48-45. 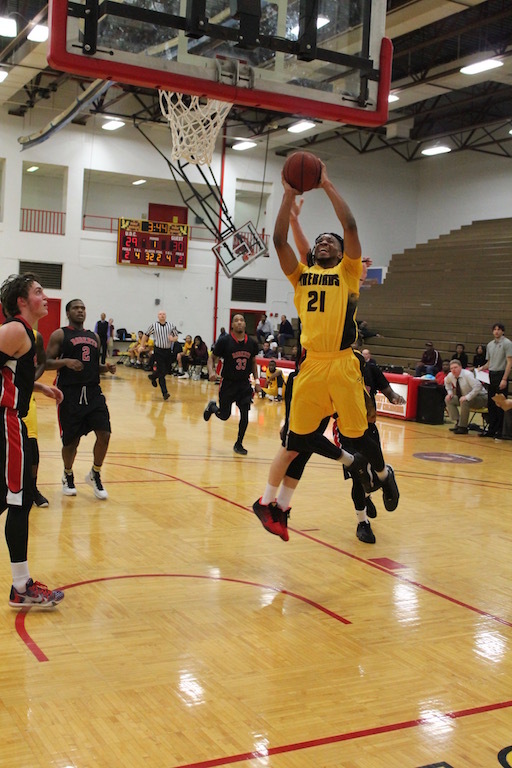 Both teams traded baskets in the early going, as UDC led 10-9 after a jump shot by RWC's Gooding at the 16-minute mark. At that point, the Firebirds used a 6-0 run aided by back-to-back baskets by junior transfer forward Jayone Troutman which built a 16-9 cushion just past the 14-minute mark. Still a 29-24 UDC lead after a layup by Erin Senegal at 5:51, Roberts used a three-point shooting barrage by Gooding and Dixon to go on an 11-6 surge that propelled the Redhawks to a 35-31 lead with 2:24 left in the opening half. Gooding went on to make two more three-pointers before the halftime buzzer as Roberts took a 41-36 lead into the intermission. The Redhawks opened the 2nd half on an 8-3 spurt, extending their lead to double-digits, 49-39 on a Dixon layup at the 16:44 mark. Dixon later made it an 11-point RWC advantage (54-43) with a free-throw at 13:43, but two consecutive Redhawk turnovers led to five straight points by the Firebirds during what amounted to a 7-1 run that allowed UDC back within four, 55-51 at the 12:28 mark. Still just a six-point Roberts advantage (59-53) with under 10 minutes remaining, Chandler knocked down a jumper, then picked Dixon's pocket and converted a fast-break layup for four consecutive points to bring UDC within two. Chandler then came up with another steal, which led to a jump shot by Troutman for the first tie of the 2nd half. Roberts regrouped though, and reclaimed a seven-point lead, 72-65 thanks to a 13-6 spurt over the next three minutes which culminated in a Mike Stone three-pointer at 4:37. The Firebirds, losers of four of their last six coming into today's game, somehow fought back with a remarkable, 8-1 surge, highlighted by two consecutive, acrobatic, penetrating layups by Chandler, as well as a gorgeous feed in the paint by Chandler to Troutman for the game-tying dunk, 73-all with 1:45 remaining in regulation. On the ensuing trip down the floor, Gooding connected on a clutch three-pointer at 1:28 to put Roberts back up, 76-73. 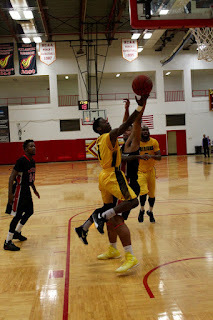 UDC once more found an answer, as Chandler penetrated and kicked out to Senegal for a game-tying three-pointer at 1:03. A wild final minute of regulation resulted in no points for either side. First, RWC's Zack Panebianco missed a layup, but the Firebirds turned the ball over after a collision near mid-court with no foul called on either side. Gooding pulled up for a three-pointer on the fast break, but his shot rimmed out with 36 seconds remaining, and Dare turned the ball over to Senegal after collecting the offensive rebound. During a scrum for the ball after the steal by Senegal, Dixon committed a foul which put Senegal on the line for a one-and-one with 32 seconds remaining. Senegal missed the front end of the one-and-one, and Dare corralled the defensive rebound. 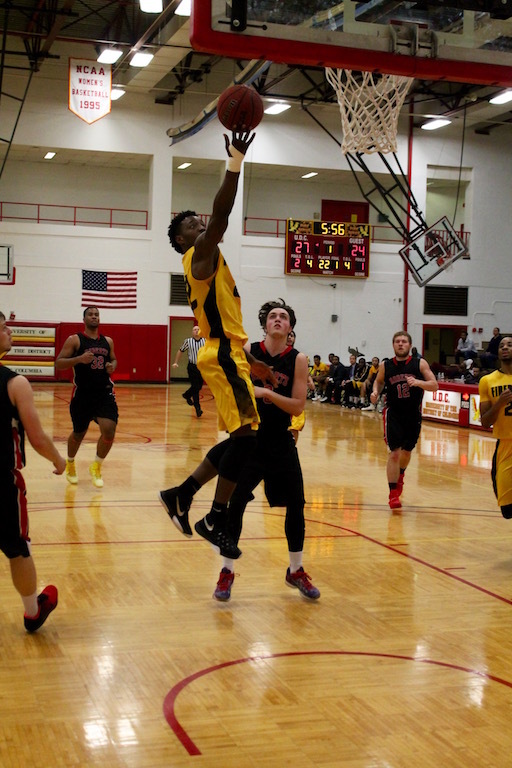 The Redhawks held for the final shot, but Dixon's layup attempt was blocked by Nickerson, and the game was sent into overtime. Gooding scored the first points of overtime after two offensive rebounds kept the Redhawk possession alive and allowed him to convert a layup nearly 30 seconds into the session. 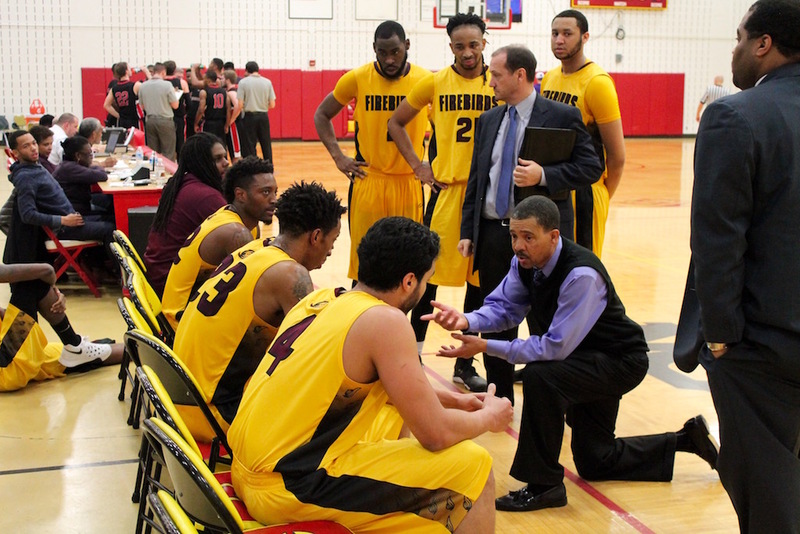 The Firebirds came right back down and answered with a dunk to tie at 78, and later Chandler made a clutch three-pointer to put UDC up, 81-78. A pair of free-throws by Stone at the 2:50 mark completed a 4-0 RWC run and put the Redhawks back in front, 82-81, but a Senegal three-pointer at 2:37 would give UDC the lead right back, 84-82. Stone tied the score once more at 86 with another pair of made free-throws, but Chandler's layup at 1:53 put the Firebirds ahead to stay. 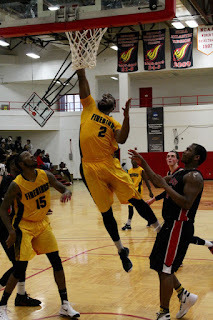 Chandler went on to score UDC's next five points as well during what amounted to a an 8-3 Firebirds surge and gave the hosts a 92-87 advantage with 40 seconds remaining. Quinn Carey came off the bench to knock down a deep three-pointer which brought Roberts within two, 92-90 with 34 seconds left, and Panebianco did the same with 10 seconds remaining to make it 96-93. The Firebirds made 5-of-6 free-throws during that stretch, however, including the final point of the game by Chandler to make it a two-possession game with only eight seconds remaining. 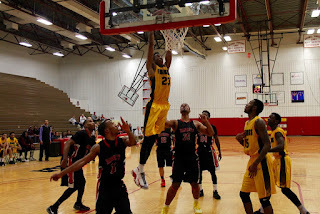 UDC went on to win by that margin, 97-93. 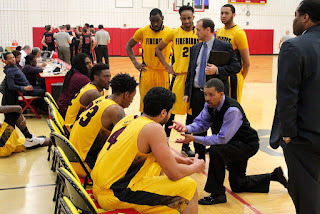 Next up, the Firebirds visit ECC foe Queens College on Thursday, February 4th.